Simon Says Stamp Scalloped Hello Card and September Card Kit Winner! I'm stopping by today to announce the winner of the Simon Says Stamp September 2015 Card Kit and to share a card using some of Simon's latest release. First, I had a question from Deborah about the camera paper I used on THIS CARD. Unfortunately it's from a past collection from My Mind's Eye called Chalk Studio that I don't think is available anymore. Just love how you used the patterned papers, they are so gorgeous in this kit! And you can never have enough Glossy Accents!!! Congrats, Shona! Please email me via my side bar with your shipping info so I can pass it on to Simon Says Stamp. For this card I used the largest of Simon's new Wavy Scallop Stitches Dies along with Simon's Doll Pink, Cotton Candy, Mint, and Audrey Blue cardstocks to create my card front, inlaying the scalloped pieces. I then die cut Simon's Painted Hello Die from some Neenah Solar White Cardstock and adhered it in place. I finished the card up with some of Lucy Abrams gorgeous Shaker Selections: Lipstick, Flamingo, and Phosphorescence. Thanks so much for stopping by! I'll be back soon to share a card using some of Simon's fabulous upcoming Stamptember release! 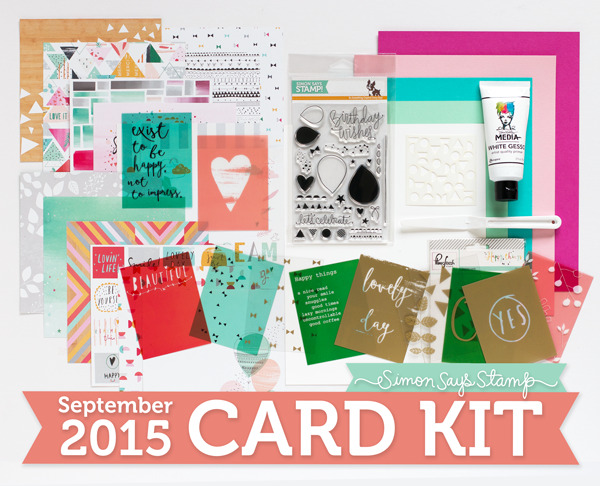 Hey Love - (Simon Says Stamp September Card Kit and GIVEAWAY)! This month's kit includes a number of fun products including Simon's new Birthday Bits Stamp Set, PinkFresh Studio Happy Things Acetate Cards, Dina Wakley Ranger White Gesso Tube, and Simon's Playful Circles stencil which is exclusie to the kit. It also includes some of Simon's great cardstocks! For this card I created the background using some of the PinkFresh Studio Happy Things 6x6 Patterned Papers (including a strip of the one I coloured for the card HERE). Then I stamped the larger balloon outline from the new Simon Says Stamp Birthday Bits Stamp Set onto some of the patterned paper with words on it to create my sentiment. I cut out the balloons, adhered them onto my card with foam adhesive, and covered them with Glossy Accents. The strings and little hearts are also stamps from Simon's fun Birthday Bits Stamp Set. Finally, I covered the hearts using a Sakura Stardust Clear Glitter Pen. Remember, you can pick up the Simon Says Stamp September 2015 Card Kit for just $29.95 + shipping. If you'd like to receive this kit and future kits for only $24.95 + shipping per month, you can SUBSCRIBE HERE. Heidi, the wonderful owner of Simon Says Stamp, has given me an extra Simon Says Stamp September 2015 Card Kit to pass on to one of you! Just leave a comment on any or all of my Septemeber Card Kit blog posts and I'll announce a winner this Friday, August 28th. Yes Let's Celebrate... (& Simon Says Stamp September Card Kit GIVEAWAY)! I was completely inspired by the black and white patterned paper that came in this month's kit. Lately I've been colouring printable patterns designed for grown ups to colour as a means of destressing so when I saw this paper I couldn't help myself. I die cut a panel using the stitched rectangle from Simon's Bundle of Stitches Dies and pulled out my Copics. Once coloured, I added the panel to my notecard on an angle, adhered one of the PinkFresh Studio Happy Things Acetate Cards on top, and stamped the rest of the sentiment and stars from Simon's Birthday Bits Stamp Set. Again, I had planned on using Stazon Black Ink for my stamping but my ink has dried out and I need to buy a refill. The Archival Ink seems to be holding up ok but if I really rub it with my finger it does smear slightly.